Iraq’s government declared military victory against the Islamic State organization (IS, also ISIS/ISIL) in December 2017, but insurgent attacks by remaining IS fighters continue to threaten Iraqis as they shift their attention toward recovery and the country’s political future. Approximately 5,000 U.S. troops remain in Iraq at the invitation of the Iraqi government and provide advisory and training support to Iraqi security forces. However, some Iraqi political groups are calling for U.S. and other foreign troops to depart, and they may seek to force Iraqi government action on this question during 2019. Iraqis held national elections in May 2018, electing members to Iraq’s unicameral legislature, the 329-seat Council of Representatives (COR). Political factions spent months negotiating in a bid to identify a majority bloc of legislators to form the next government, but the distribution of seats and alignment of actors precluded the emergence of a dominant coalition. Meanwhile, protests and violence in southern Iraq highlighted some citizens’ outrage with poor service delivery, lack of economic opportunity, and corruption. In October, the COR chose former Kurdistan Regional Government (KRG) Prime Minister and former Iraqi Deputy Prime Minister Barham Salih as Iraq’s President. Salih, in turn, named former Oil Minister Adel Abd al Mahdi as Prime Minister-designate and directed him to assemble a slate of cabinet officials for COR approval. Abd al Mahdi is a consensus figure acceptable to rival factions, but he does not lead a party or parliamentary group of his own. COR members have confirmed most of Abd al Mahdi’s cabinet nominees, but key political groups are at an impasse over certain ministries, including the Ministry of Interior and the Ministry of Defense. Iraqi politicians have increasingly reached across sectarian political and economic lines in recent years in an attempt to appeal to disaffected citizens, but ethnic and religious politics remain relevant and Iraqi citizens remain frustrated with government performance. 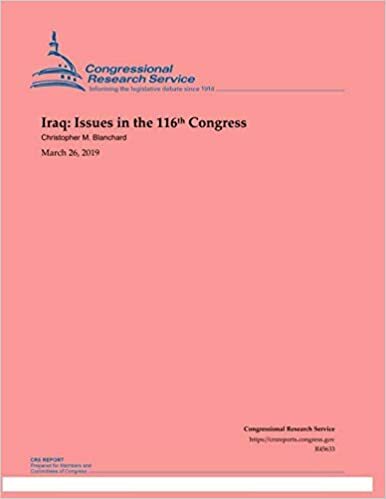 Iraq’s neighbors and other outsiders, including the United States, are pursuing their respective interests in Iraq, and their competition creates additional challenges for Iraqi leaders. Paramilitary forces have grown stronger and more numerous in Iraq since 2014, and have yet to be fully integrated into national security institutions. Some figures associated with the volunteer Popular Mobilization Forces (PMF) that were organized to fight the Islamic State participated in the 2018 election and won COR seats, including critics of U.S. policy who have ties to Iran and are demanding the United States withdraw its military forces. The Kurdistan Region of northern Iraq (KRI) enjoys considerable administrative autonomy under the terms of Iraq’s 2005 constitution, and the KRG held legislative elections on September 30, 2018. The KRG had held a controversial advisory referendum on independence in September 2017, amplifying political tensions with the national government, which then moved to reassert security control of disputed areas that had been secured by Kurdish forces after the Islamic State’s mid-2014 advance. National government security forces and Kurdish peshmerga are deployed along contested lines of control, as leaders negotiate a host of sensitive issues. Stabilization and Reconstruction. Daunting resettlement, stabilization, and reconstruction needs face Iraqi citizens and leaders as they look to the future. More than 4 million Iraqis uprooted during the war with the Islamic State group have returned to their home communities, but many of the estimated 1.7 million Iraqis who remain internally displaced face significant political, economic, and security barriers to safe and voluntary return. Stabilization efforts in areas recaptured from the Islamic State are underway with United Nations and other international support.